The Congress today went on the offensive against the BJP, alleging that Deputy Prime Minister L.K. Advani was involved in “planting” the lead story in an English daily to kick off a fresh controversy on the Bofors deal in the run-up to the Lok Sabha poll. Praising Rahul Gandhi for his political acumen, technology guru Sam Pitroda has said the young leader and Congress nominee from Amethi was more mature than many seasoned politicians in the country. With the Congress training its guns at Prime Minister Atal Behari Vajpayee and Deputy Prime Minister L.K. Advani, the BJP today made its intentions clear to go all out against Congress President Sonia Gandhi on the Bofors and foreign origin issue. Prime Minister Atal Bihari Vajpayee today declared himself a “a born Bihari.” “Main Uttar Pradesh mein paida hua par janm se Bihari hoon (though born in Uttar Pradesh I am a Bihari by birth),” he declared at an election meeting here. Deputy Prime Minister L.K. Advani today said that the BJP's promise of "Ram Rajya" in the country was no different from Mahatma Gandhi's dream of "Adarsh Raj"(ideal government). In a victory of sorts for the group-led by Tamil Nadu PCC chief G. K. Vasan, former Union Minister Dhanushkodi Adithyan has been fielded by the Congress from the Tirunelveli seat in the state for the coming Lok Sabha poll. 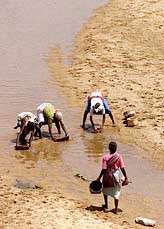 Unaware of the Bharat Uday Yatra, which passed near by them, tribal women are busy fishing in a dried up river at a village in Janjgir district, Chhattisgarh, on Sunday. Union Minister for Commerce, Law and Parliamentary Affairs Arun Jaitley is also the BJP General Secretary for Karnataka affairs. The Nationalist Congress Party (NCP) President, Mr Sharad Pawar, has charged the Vajpayee-led NDA government at the Centre with pursuing economic policies that are harming the national interest and causing hardships to farmers, labourers and the middle class. Former Prime Minister V.P. Singh listens to the grievances of slum dwellers regarding the demolition of their 'jhuggies' at Yamuna Pusta in New Delhi on Sunday. 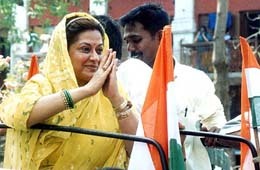 Veteran actress and Congress candidate Mousumi Chatterjee campaigns in Kolkata on Sunday. The Uma Bharati government, fully occupied as it is with the Ujjain Kumbh and the Lok Sabha elections, is facing a threat from another quarter. Three persons, including the founder of an NGO, Shabnam Hashmi, who were on a nationwide mission to motivate voters, were allegedly roughed up by VHP activists in Vadodara today, the police said here. Armed with top singers in its kitty, the BJP has decided to organise musical roadshows across the country to woo voters. The police today arrested Mr Sunit Dutta, a group D staff member of Visva Bharati, after finding from his residence, the lock of Udyan Bhavan which was found broken yesterday. In a major initiative to inform and educate people on their ‘rights’ vis-a-vis ‘Right to Information Act’, NGO ‘Parivartan’ has formed a forum here. The ‘Delhi Right to Information Manch’ will make people aware of their ‘rights’ under the ‘right to information’, besides awakening them to its benefits in their day to day life, ‘Parivartan’ spokesman Arvind Kejriwal. A vision correction technology, developed by scientists in the USA, has been introduced in India which besides improving sight, betters the night vision and contrast sensitivity of the patients post Lasik, experts said here yesterday. A devotee today donated idols of lord Satyanarayana Swamy and his consort, Ananthalakshmi Satyadevi, made of gold within a mandap to Annavaram Devasthanams here. Portugal has refused to give asylum to former Bollywood starlet Monica Bedi, wife of Mumbai serial bomb blast accused Abu Salem alias Abdul Qayoom Ansari. Eunuchs demand a separate gender for themselves. Christians around the country celebrate Easter. Women beat men in a traditional festival to wish them marriage. 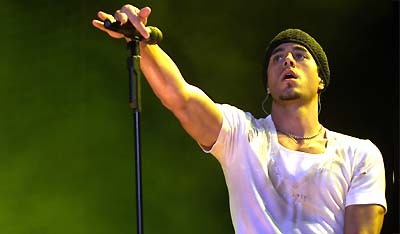 Music of Farhan Akhtar's Lakshya released. Pakistani superstar to act in Bollywood. “We are fully aware as to who are behind the story. Deputy Prime Minister L.K. Advani himself had informed a popular magazine that this story was coming in the English daily,” Congress spokesperson Kapil Sibal said here. Asserting that the newspaper did not bring any fresh evidence, as suggested by Prime Minister Atal Bihari Vajpayee, to link the Congress President Sonia Gandhi in the Bofors controversy, Mr Sibal said though the newspaper claimed that Swedish investigator Sten Lindstrom had made fresh revelations to it, there was actually nothing new. “The story is planted. See the timing of the story,” he said. Displaying a photocopy of the Lindstrom’s interview to Outlook magazine in April 1998, Mr Sibal said what the newspaper has published was exactly the same allegations the Swedish investigator had made in the magazine. “Then where is the fresh evidence?” a visibly angry Sibal said, adding “they cannot face a lady who is rising in popularity on a daily basis. They cannot accept a hardworking and sincere woman who honestly wants to do something for this country”. The report of the Outlook issue dated April 6, 1998, could have come to the notice of the CBI at that point of time itself. “But the CBI did not question Ms Gandhi any time since 1998 because it knew Ms Gandhi did not have any role in the matter. The Rajiv Gandhi family had come out clean in the allegations when Delhi High Court pronounced its judgment in the Bofors case two months ago,” he said. The newspaper published a report by Mr Lindstrom, who had probed the Bofors-India Howitzer case for 18 years, in which he said the links between Ms Gandhi and the Italian businessman Ottavio Quattrocchi, an accused in the Bofors case, should be probed. “Rahul has analysed all the previous elections in the country, even though he is new to the game of politics,’’ Mr Pitroda, a close aide of former Prime Minister Rajiv Gandhi and head of the Telecom Mission in the 1980s, said. The Chicago-based Mr Pitroda, who is campaigning at an ‘’intellectual level’’ for the Congress for the upcoming Lok Sabha polls as he does not enjoy public rallies, also noted that Rahul was well-versed on economic issues and had the necessary academic qualifications. He reiterated that the BJP-led NDA Government should not take credit for the economic reforms initiated during the Congress rule at the Centre. In this context, he said whenever major players, like Reliance, entered any economic sector, privatisation picked up momentum. ‘’With a gorilla like Reliance in the telecom sector, it is bound to take off,’’ he said adding that the government could not take credit for this. The BJP, which at regular intervals had been asserting that its main poll plank would be development and the NDA government's achievements, today preferred to step up its attack against Ms Gandhi, accusing her of "taking shelter behind her children on the Bofors issue." The party also released a campaign cassette on the "foreign origin theme" composed and sung by famous music director and singer Ravindra Jain, who formally joined the BJP here. The cassette will be extensively played during the campaigning across the country. Describing Ms Gandhi's utterances as a "sad and bad commentary" on the Bofors issue, BJP spokesperson and General Secretary M.A. Naqvi said, "Her taking shelter behind her children on the serious allegation being levelled against her is not part of our culture." 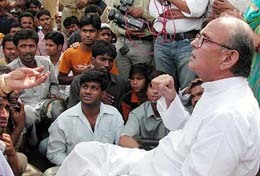 "The needle of suspicion moves around Ms Gandhi herself and the main question is what was her relationship with Italian businessman and Bofors middleman Ottavio Quattrocchi, his access to the Prime Minister's residence and how he succeeded in promoting his dubious business interests in India?," Mr Naqvi said, reminding that Ms Gandhi is presently the Congress President, but under question and controversy is her role as the wife of late Prime Minister Rajiv Gandhi. Reacting to the Congress submission that the Bofors controversy is an old one and there was no new revelation in it, Mr Naqvi said, "The million dollar question is whether or not the allegations are true? Moreover, it would be Ms Gandhi and none other to spell the truth about the Bofors and Quattrocchi controversy." Wondering why people made such a ‘hue and cry’ over his earlier remark, Mr Vajpayee asserted that “I am both Atal and Bihari”. Stating that his brothers too carried Bihari as their middle name, he said his father named them Prem Bihari, Sada Bihari and Awadh Bihari. Promising to build Ram temple at Ayodhya "soon after the return of the BJP government at the Centre", Mr Advani told the villagers gathered to welcome his Bharat Uday Yatra at Nandghat in the Durg parliamentary constituency that the Ram temple would be built in a congenial atmosphere. Mr Advani said the BJP-led government would also usher in "Ram Rajya" in the country. "Mahatma Gandhi had dreamt of an 'Adarsh Raj' which he felt was no different from Ram Raj". The Deputy Prime Minister had one constant refrain in his election rallies in Chhattisgarh: to reject the Congress as comprehensively as in the 1977 Lok Sabha poll. As his yatra unwinded through the plains of Chhattisgarh in the scorching sun, Mr Advani urged people to give the BJP a huge win. He asked them to vote for returning Atal Bihari Vajpayee as Prime Minister to enable him to carry on the "good work" of the past six years. "We will make India a developed country by 2020. Water, roads , power will be provided to all six lakh villages in the country.We will consider India developed when every field is irrigated and every family has a house," he said. Comparing popularity of Mr Vajpayee with that of Jawaharlal Nehru in his key days, Mr Advani said every BJP and NDA candidate was "two-in-one" "A vote to the BJP and the NDA candidate will also be a vote to make Mr Vajpayee the Prime Minister," he said. Mr Advani today inquired about the health of Ajit Jogi, who was critically injured in a road accident and had to be shifted to Mumbai. The Tirunelveli seat was understood to have been earmarked for a businessman, Mr H. Vasanthkumar, brother of former PCC chief Kumari Anandan. In the list of 16 candidates released here today, the Congress has fielded Mr Rampujan Patel, a Union Minister under the prime ministership of Mr V.P. Singh from Phulpur constituency in Uttar Pradesh. The party has also nominated Reena Chaudhary, Samajwadi Party MP in the dissolved Lok Sabha, who joined the party only few days ago, from her constituency Mohanlalganj (SC) adjoining Lucknow. Ending speculation whether former Madhya Pradesh Chief Minister would take on his brother Laxman Singh in Rajgarh or not, the party today fielded former high court Judge Shambhu Singh from the seat. In Uttar Pradesh the party has renominated Mr Saiduzzaman from Muzaffarnagar. 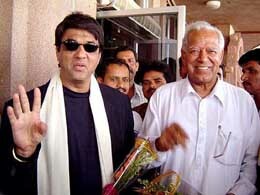 He represented the seat in the dissolved Lok Sabha. Mr Nathu Ram Verma (Jalaun-SC), Mr Ashok Dhanwik (Ghatampur-SC), Prof Rajendra Kumar Dixit (Etawah), Mr Rajesh Rajput (Etah), Mr Surendra Singh (Agra) and Mr Tarachand Shastri (Saharanpur) were among the 10 candidates from UP. In Madhya Pradesh the party has nominated Mr Om Raghuvanshi from Hoshangabad, Mr Sajad Ali (Bhopal), Mr Narmada Prasad Sharma (Vidisha) and Mr Umang Singh Singhar (Dhar-st). With today’s list the Congress has cleared all 10 seats in Tamil Nadu, all 29 seats in Madhya Pradesh and nearly two-third seats in Uttar Pradesh. Union Minister for Commerce, Law and Parliamentary Affairs Arun Jaitley is also the BJP General Secretary for Karnataka affairs. Having pitched camp in a Bangalore hotel, he is playing the role of master strategist and chief spokesperson in the state to a T. He is enjoying taking on the Congress both at Centre and in the state, even while finding time to engage with exporters or with the Finance Ministry on issues facing them. He was candid with The Tribune on the BJP’s strategies for the state and their poll prospects. Q: When it was decided that you were to come here what kind of approach strategy did you have in mind for the state? A: The strategy is always to consolidate gains. We wanted to expand our base, and if there are alliances to be made, to make them. If you are in government, you create a “feel good” factor. If you are in the Opposition you create an anti-incumbency. We believe that this was already there and we only had to strengthen it. Q: In the previous election in 1999 when the Congress came to power, most people felt that it may not be possible for the BJP to come to power here for a long time. Already though significant advances seem to have been made. What changed? Was it just the Atal factor? A: No, it isn’t only that. The BJP as a party has evolved and continues to evolve, while the Congress has failed to learn lessons. We are a meritocracy driven party, we are churning out leaders based on merit. The Congress on the other hand is driven by family. They have destroyed their own second generation of leadership and installed pygmies. The BJP is like a first generation entrepreneur, while the Congress is like a fourth generation family business in decay. In Karnataka there was a space for the Congress and a huge non-Congress space, which was occupied by the Janata Dal and other parties. There has been a re-polarisation, a refining of the social engineering that is taking place and we began to take over the non-Congress space. We absorbed legacies of earlier parties like those of Mr Hegde’s, we adapted to changing times. Mr Vajpayee, of course, is the engine driving our campaign. The Congress has systematically destroyed mass leadership and their national leaders have no appeal at all. Q: You used the words ‘social engineering’ to describe changes in the polity. The BJP has been accused of being a party of the elite and the upper castes, and even your JD (U) alliance partners feel that they complement you on this as they can take the backward classes along. The Left parties and others intellectuals on the Left also make this argument. A: Actually, more ST/SC/ and OBC candidates vote for us than for the Congress. As for the Left, with the collapse of the Soviet Union and other changes that have taken place they have long lost the political argument. Globally, they have lost the economic argument, which is why you seem them talking on collateral issues like feminism, environment, and human rights. Not that these are not important issues. In the next decade or two I see rapid economic development. Affluence will spread. And the Left’s arguments will be further undermined. Q: How do you see the poll going in Karnataka? A: We appear quite strong in many districts. I am looking forward to a clear and decisive mandate in our favour. This electorate does not believe in hung Assemblies. People have a sense of fairness, and similarly situated people start thinking alike and they’ll vote alike. Our not naming a chief ministerial candidate is not because of indecisiveness, it is part of our strategy. In a signed statement after his discharge from the Breach Candy Hospital here following a surgery on the left jaw, Mr Pawar said unemployed youth, farmers, labourers, Dalits, tribals and minorities could have no hope of a better tomorrow from the NDA government. “Voting such a government will amount to “manavdroh (anti-human). I appeal to the people of the state to oust the BJP from power in the coming elections,” he said. Referring to the surgery he underwent which had kept him away from election campaigning, the former Maharashtra Chief Minister said “With thinking people like you and workers on my side in this decisive fight, I can rest assured that the Congress-NCP-RPI and JD(S) candidates will win comfortably against the Shiv Sena-BJP candidates”. He also expressed confidence that all workers from the Democratic Front (DF) coalition would keep aside their differences and unitedly work for the victory. Mr Pawar hit out at the “double standards” of the NDA, especially Shiv Sena chief Bal Thackeray, citing an example of how the Sena supremo had kept mum when Prime Minister Atal Bihari Vajpayee at a function in Mumbai had called for “fighting thoughts with thoughts” instead of banning books. More than half a dozen employee organisations have joined hands to launch an agitation in protest against the non-fulfilment of their demands as promised by the BJP during campaign for the Assembly elections. They had been demanding payment of dearness allowance at the Central scale, merger of 50 per cent DA in the basic and cash payment of the arrears, abolition of profession tax, payment of bonus to the Class IV employees, regularisation of shikshakarmis (education workers) employed on a contract basis and reinstatement of daily wagers who were sacked by the previous Digvijay Singh government. The decision to launch a joint agitation from April 30 was taken at a meeting attended by office-bearers of the employees’ organisations, including the Madhya Pradesh Tritiya Varga Shasakiya Karmachari Sangh, Madhya Pradesh Laghu Vetan Karmachari Sangh, Madhya Pradesh Lipik Vargiya Karmachari Sangh, Madhya Pradesh Nyayalayeen Karmachari Sangh and Sahayak Pashu Chikitsa Adhikari Sangh. The employee leaders decided to organise dharnas at all district, tehsil and block headquarters and submit memoranda listing their demands to senior officials. If the government failed to give positive signals, a statewide agitation will be launched just before the Lok Sabha elections, according to the decision. Hashmi has filed an FIR at the Sayajigunj police station. Meanwhile, two VHP activists were arrested in this regard, the police said. Hashmi said that during the press conference even some journalists `objected’ to her statement that “India Shining” was a lie and alleged that “she had embarked on an anti-Gujarat campaign” and left the venue in a huff. The journalists also reportedly raised slogans against Hashmi and her group and urged other journalists to boycott the meet. Immediately after this, the VHP men allegedly barged inside and began raising slogans against her and the group and also indulged in abusive language apart from damaging her vehicle. Top playback singer Kumar Shanu, ghazal and bhajan singer Anoop Jalota and famous music composer and singer Ravinder Jain will fan out across the country and hold musical evenings in the run up to the polls. "The basic idea is to reach out the voters through the medium of lively music...convey the party's issues and achievements to the voters through songs, entertain them and woo them to vote for the party," a top party functionary said. He claimed that it would be a novel way of campaigning as there won't be any customary speeches by politicians or the local candidate. The 'bard' of Assam and a noted singer Bhupen Hazarika, who is contesting the coming Lok Sabha elections from Guwahati seat, will remain confined to Assam and hold some musical roadshows in the state, sources added. Sub Divisional Police Officer R Sarkar said Mr Dutta, himself an employee of Udyan Bhavan, was the first person to have informed his seniors about the broken lock yesterday. The lock and some instruments used for breaking locks were found hidden in a shoe box in his house, Mr Sarkar said. The district police was interrogating him. Close on the heels of the burglary of Rabindranath Tagore’s Nobel medallion and other personal memorabilia from the Rabindra Bhavan complex of the Visva Bharati University, the lock of the main gate of the gardening department of the varsity was found broken yesterday. Udyan Bhavan, where the broken lock was detected, is diagonally opposite to the complex, a high-security area now, from where the Nobel medallion was stolen. The Bhavan houses the university’s gardening department. In a major initiative to inform and educate people on their ‘rights’ vis-a-vis ‘Right to Information Act’, NGO ‘Parivartan’ has formed a forum here. The ‘Delhi Right to Information Manch’ will make people aware of their ‘rights’ under the ‘right to information’, besides awakening them to its benefits in their day to day life, ‘Parivartan’ spokesman Arvind Kejriwal. “The move is basically to make people aware of the power of the ‘Delhi Right to Information Act’ and its usefulness in their everyday life.’’ The ‘manch’ would hold its meeting in association with the Delhi University,’’ he told UNI. Along with sharing the experiences of those who have accessed the ‘Right to Information Act’, the ‘manch’ would also endeavour to collectively address the bottlenecks being encountered during the ‘implementation’ phase, besides spreading awareness among the people on it. Informing about of the ‘manch’s’ two meetings, which brought several interesting facts that affected people directly, Mr Kejriwal said “While one was able to get a polluting factory unit in his neighbourhood shut down using the right to information, another person could take the possession of his flat which was being denied to him in a case of allotment. The ‘manch’, which meets on the first Sunday of every month, will now be jointly organising it with the Delhi University there. In every meeting, one matter, like works claimed to have been done by MLAs in the last five years, would be taken up and a workshop held on how to draft questions and where to file applications to seek information on the issue, he added. Also, the people would be encouraged to make applications under the Right to Information Act to seek official inspection of these works in their respective constituencies. “The technology, at present, is the best available across the globe as it does about 30,000 calculations on a single eye and enables the eye surgeon choose the best treatment for the patient,” Padamshree awardee, Optometrist Vipin Buckshey told reporters here yesterday. The technology, VISX Star S4, had an edge over other technologies as it was suitable for most of the eyes because of the fact that it removed minimum corneal tissue. It helped people overcome the problems of night glare and contrast sensitivity, he claimed. A 3D eye tracker installed in the machine provided 25 times more precision than standard measurements used for glasses and contact lens, he said. Devasthanams Executive Officer G.V. Narasimha Moorthy told UNI that the devotee from Hyderabad, who presented the idols, weighing 100 gm and worth more than Rs 60,000 to the temple, preferred anonymity.